When a girl tries to retrieve her kite from a bear's cave and he accidentally breaks it she throws a tantrum, stomping her way home and yelling, "Horrible Bear" all the way. The bear becomes angry about being called "horrible" and comes up with a plan to get back at the girl. Instead, they both learn the power of forgiveness and that accidents happen. This is a fun story with a good lesson. I read this book because I know that Dav Pilkey's books have great appeal for many of my students, especially my more reluctant readers. Although not the type of book that appeals to my reading tastes, I can understand why students would like it. The absurd, sometimes gross humor is the sort that they find entertaining. The graphic format also makes this the type of book my elementary readers will find fun to read. Even though I have not read many of Dav Pilkey's books, I love the message that he has worked to get out to students about choosing books they like to read and reading for fun. He has a few videos, such as this one that help to inspire students to read. E.B. White's passion for writing began when he was young, as did his love for the state of Maine, which when he moved there as an adult provided inspiration for his books. This biography provides so many wonderful details about E.B. White's life and his writing. 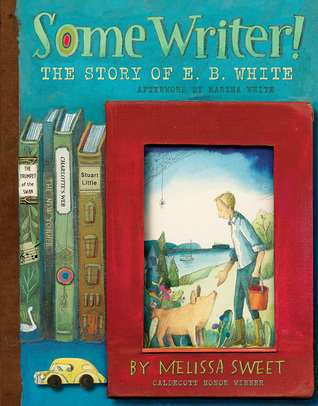 The book also tells the backstory of his classic books, such as Charlotte's Web. The illustrations are beautiful, but in addition photographs and writing, such as letters and story drafts, are included to bring E.B. White to life. Although written for children, there is much in the book about E.B. White's life and writing process that adults will find interesting. Loved Horrible Bear. What a great story! I just started Some Writer--I was so thrilled to discover it's a chapter book! I would have loved it as a picture book too, but now there is so much more Melissa Sweet to love. I am reading very slowly because there is so much to look at and appreciate on each page. I have read many Dav Pilkey books aloud to my son, and I have to say, they're really well-written. I was skeptical, but they make surprisingly good read-alouds. 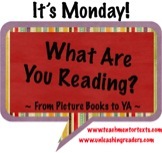 As I was reading it I was thinking it would make a picture book, too, and wondered why it was a chapter book. Then I read at the end that Melissa Sweet had so much information that she had to make it into a chapter book. I just gave the book to a teacher who always reads Charlotte's Web to her class. I appreciated in this Dav Pilkey book that he made a plug for reading in one of the chapters. I've been curious about Some Writer also. I ordered it for the library but haven't gotten it unpacked just yet (unfortunately we are under major remodeling and are a bit behind). I am anxious to read it. Hopefully you can get the library straightened out and start reading it! Horrible Bear is so sweet and fun, and I love OHora's really distinct illustration style. He is a great illustrator! Horrible Bear is awesome! I really need to read the other two. Dog Man is one I know would be popular with my students, so I really should get my hands on it and read it! Have a great week! We have a copy of Dog Man in the library, but I probably should get another one since I'm sure it will be a favorite. I really have to find Some Writer - I love reading PBBs on authors/illustrators/novelists.